So, this one's for the serious coffee drinkers. Starbucks Reserve is Starbucks' specialty brand that's dedicated to the craft of coffee. And most recently, they've created a new ice cold drink. Nope, it's not a new kind of unicorn frappuccino. It's like, legit coffee for people who actually know what "single origin" means. It's called the "Cold Foam Cascara Cold Brew" and we had the opportunity to try it out. We felt very special because you can only get it in New York City at STORY, which is a concept shop that partnered with Starbucks to debut the exclusive coffee. Although, according to Reddit, there have been rumors of some variation of this beverage being beta-tested in certain markets. It's made with a very special roast of Starbucks Reserve pour over coffee from Peru mixed with a little vanilla syrup. After the coffee is poured, the special "cold foam" is added. The cold foam is made in a special blender with non-fat milk and a special cascara syrup, which is made from the skins of coffee cherries. There's a final dash of sprinkles on top. Let's be honest, we're just here to try this cold foam witchcraft and see it how it holds up in an iced drink. But I loved this coffee! I take my coffee with milk and sugar, and the creamy sweetness of the cold foam was just enough to make this enjoyable for me. The vanilla syrup cut the usual bitterness of coffee, and the cold foam texture was actually amazing — fluffy, light, and slightly sweet but definitely not overpowering. The sprinkles gave a nice little crunch to the coffee. Even though this cold brew is exclusive to STORY until May 13, 2018, the barista told me that it would be released eventually to other locations, which is great news. I would definitely drink this coffee again. She said, "so I'm not usually the ~biggest fan~ of cold brew, mostly because I feel like it often has an overpowering bitter taste — even when I drown it in soy milk and sugar. So I was pretty surprised when A: it tasted really damn smooth, and B: the "cold foam" was...actually foam. Once it's poured on top it kinda looks like a dollop of melted whipped cream, to which I was like, there's no way this is gonna feel like foam. 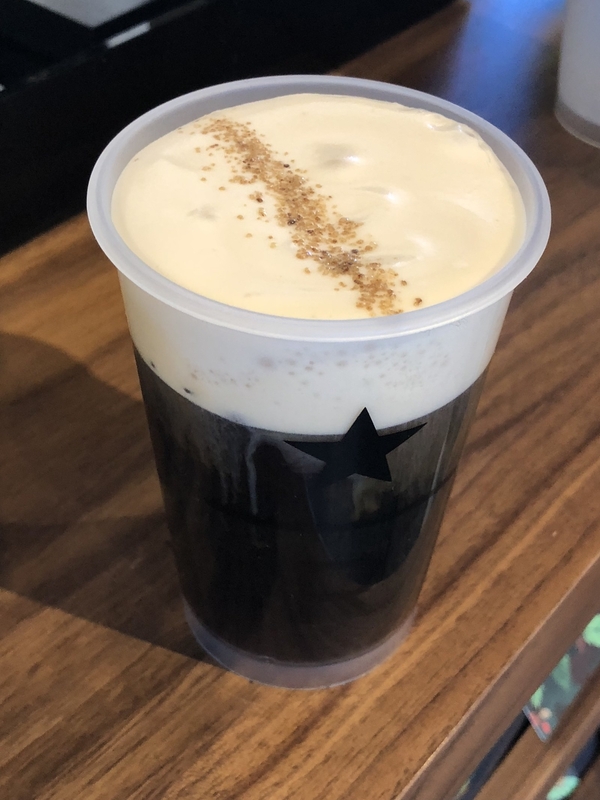 But somehow it was a full, frothy cold foam that paired perfectly with the cold brew — which kind of felt like a magical concoction from the Wizarding World of Harry Potter. So to sum it up: I really liked it. 10/10 would drink again." 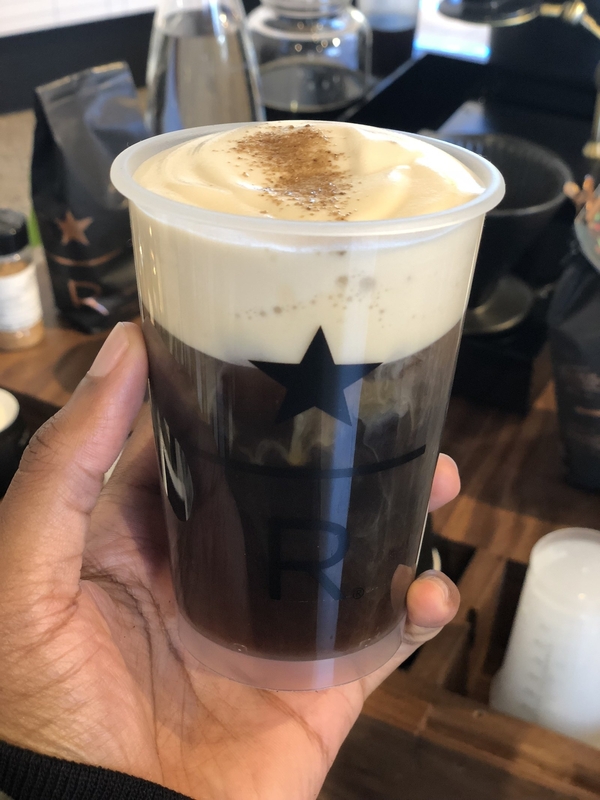 If you happen to be in New York City and love coffee you can pick up the cold foam cold brew from STORY for $5.50 until May 13, after which it will be available at select Starbucks locations.